1.Cryptosystems that have the potential to be safe against quantum computers such as: code-based, hash-based, isogeny-based, lattice-based, and multivariate constructions. 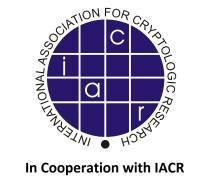 2.Implementations of, and side-channel attacks on, post-quantum cryptosystems. 3.Security models for the post-quantum era. Accepted papers are planned to be published in Spring's LNCS series.Submissions must not exceed 12 pages, excluding references and appendices in a single column format in 10pt fonts using the default llncs class without adjustments. Final version of accepted papers will be limited to 20 pages.Submissions must not substantially duplicate work that any of the authors has published in a journal or a conference/workshop with proceedings,or has submitted/is planning to submit before the authors notification deadline to a journal or other conferences/workshops that have proceedings.Submissions should begin with a title,the authors' names and affiliations,a short abstract,and a list of keywords.Submissions ignoring these guidelines may be rejected without further consideration. Please submit your paper to EasyChair. Chongqing University (CQU) is located in Chongqing. It has four campuses of A, B, C and Huxi. A,B,C Campus is located at No.174 Shazheng Street,Shapingba District. And Huxi Campus is located at No.55 University Road South, Shapingba District.